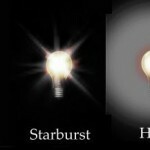 Two potential side-effects of LASIK eye surgery are “starbursts” and “halos”. The short answer is yes. The more precise answer is “It doesn’t have to matter.” The pupil acts as the apperature in a camera constricting in bright sunlight to protect and dilating under dim illumination situations to allow maximum light for visual function at night. Many pupils can be as small as 2 mm in bright light and enlarge to as much as 7 mm or more in the dark. The side-effect of halos and starbursting around lights at night is well known in LASIK and various other eye surgeries and is easy to understand if you consider that LASIK, as originally performed, treated only the central 5.5 to 6 mm of the cornea. The admonition against LASIK in patients with large pupils was easy to understand and was logical when all LASIK was conventional, as performed over 10 years ago. Today, however, we have the ability to treat with much larger treatment zones and with a technology known as “custom” or wavefront-guided LASIK. 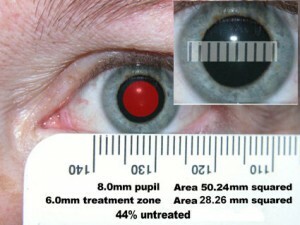 Several large studies found that pupil size had no relation to night vision problems when wavefront technology was utilized to perform the LASIK procedure. Data from studies utilizing a VISX laser with wavefront guided LASIK treatments found that night vision problems were reduced 20-fold compared to conventional LASIK. Patient satisfaction with their night-vision actually had a tendency to increase compared to night-vision satisfaction with glasses or contacts when wavefront-guided LASIK was performed. So, as long as your LASIK surgeon is using the latest technology, you can ignore the out-dated advice warning against LASIK in large pupils. Of course, before undergoing LASIK or any other type of surgery, you should discuss all risks and concerns and be sure you understand and are comfortable with these before proceeding. Improvements in LASIK technology continue to improve success rates and reduce the risk of side-effects. To maximize your chances for success, don’t settle for just LASIK: insist on wavefront-guided LASIK.